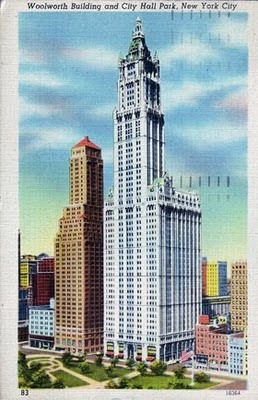 The building was headquarters of the F. W. Woolworth Company until 1998. Its location is in Lower Manhattan at 233 Broadway, one block east of the site of the World Trade Center and four blocks north of the site of the Singer Building. This postcard has a 1947 postmark and is a "linen" card because it is intended to look as if it was printed on cloth, which was a popular postcard style from the 1930s through the 1950s.